Purchase the right paint for your outdoor project—be it mortar, wood, flooring, or trim—and get durable, beautiful results for your hard work. Painting the outside of your house probably isn’t your idea of a good time. 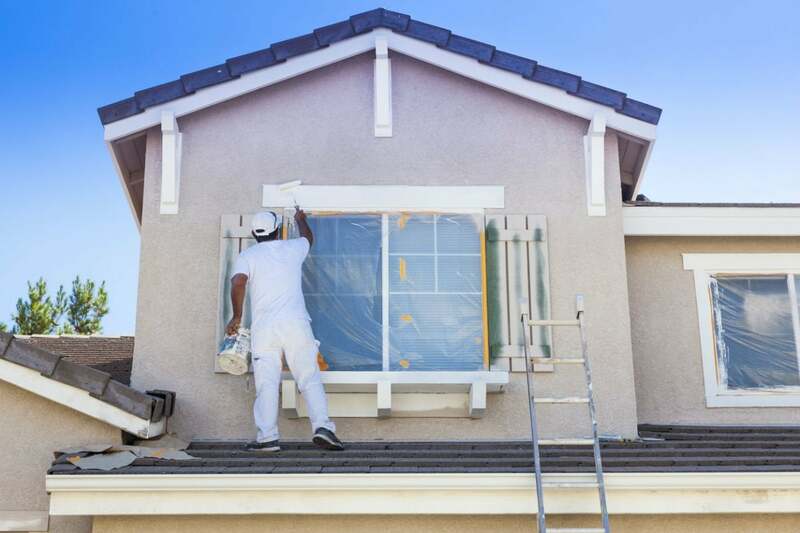 But if you use the right paint, you can expect the results to look fresh for a decade on a stucco surface, and as long as seven years on siding. The best exterior paint, be it latex- or oil-based, forms a durable bond on siding, decks, or whatever else you’re painting outdoors—offering protection from the elements while giving it a fresh new look. Using the wrong paint, however, can lead to cracking and peeling within a year. Because outdoor surfaces are subjected to harsh UV rays, temperature extremes, and battering storms, pony up for a good quality paint designed for the material you’re working with. Keep reading to learn what makes an excellent exterior paint and why the following formulas made our list as best for particular projects. A gallon of exterior paint runs anywhere from $8 to more than $50—and this is an area where you typically get what you pay for. More expensive paints usually contain higher-quality ingredients and come with longer warranties. Paint with a 15-year warranty is likely to be more durable than paint with a five- to 10-year warranty. Chemicals and solvents found in paint products can emit toxic fumes known as volatile organic compounds (VOCs). 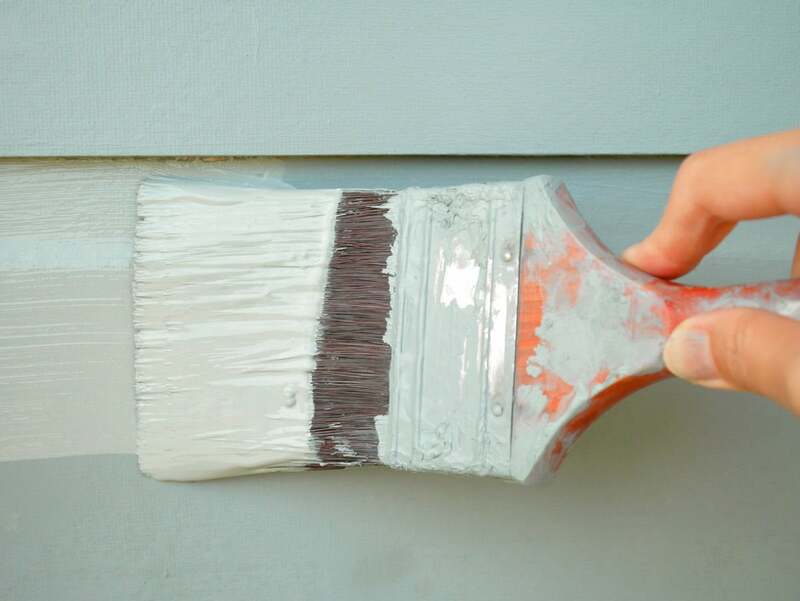 These malodorous fumes can cause headaches and nausea if inhaled and, while less likely to bother you when painting outdoors, you may still wish to choose a paint labeled as “Low-VOC” or “Zero-VOC.” Of the two types of exterior paints, oil and latex, oil paint is higher in VOCs. Different paints have different dry times, and you must wait until the first coat is dry before applying a second coat. This is something to consider if you have a limited time in which to complete a project. Most latex paints dry to the touch within a couple of hours and a second coat can be applied in four to six hours. Oil paint, however, dries to the touch in six to eight hours and may require up to 24 hours before a second coat can be applied. Dry times are listed on the paint can. Low-quality paints contain cheap pigments that tend to fade over time, especially if the painted surface has a southern exposure and receives direct sun. Keep in mind, too, that dark colors are more likely to fade than light hues on your exterior. If you’re going with a dark or bright shade on trim or shutters, look for “titanium dioxide” on the ingredient list—a pricey but long-lasting pigment usually found only in premium paint lines. Good paint should be able to handle whatever Mother Nature throws its way. Oil paints are very good at withstanding rain, and for many years, oil was the standard for exterior paint. That all changed with the development of acrylic-based latex paint. Acrylic is a binder that allows latex to flex slightly, making it less likely to become brittle and crack and therefore able to better repel rain. The highest quality latex paint labels feature the words “all acrylic” or “100 percent acrylic.” While cheaper paints will often contain a small amount of acrylic, they usually don’t contain enough for the paint to be truly weather resistant. While there are exceptions, the general rule is to use the same type of paint that’s already on the surface. For example, if your siding was already painted with latex, choose latex and if it was painted with oil, choose oil. Putting oil paint over latex often causes bubbling and peeling, as the solvents in oil paint melt the latex. The paint you choose should also be compatible with the material you’re painting. Paint designed to cover wood siding may not adhere well to aluminum or vinyl siding. Compatibility is listed on the paint can and in products online description. 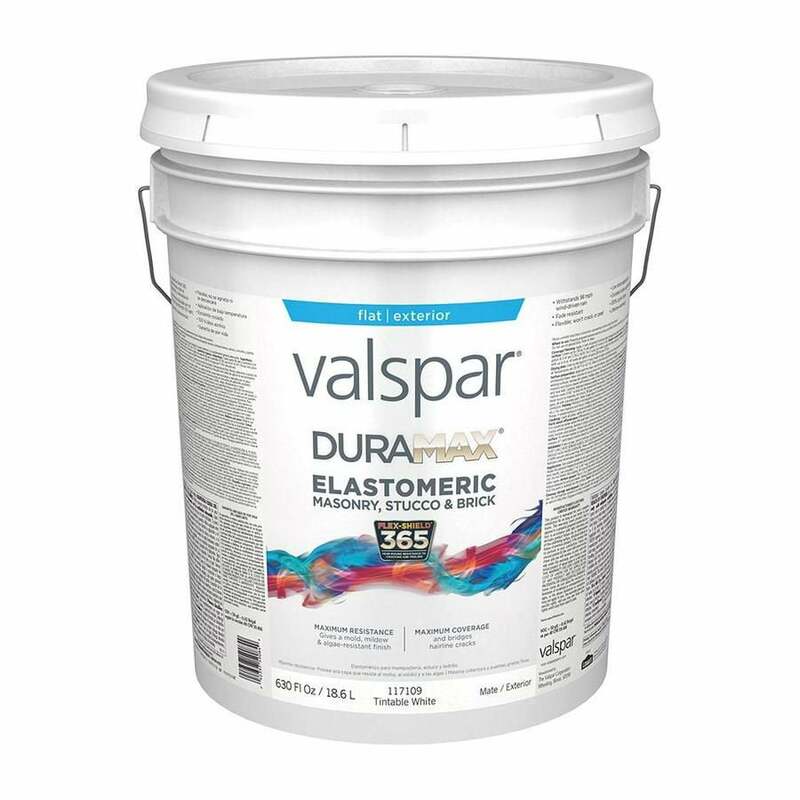 Latex-based Valspar Duramax Flat Masonry and Stucco Paint dries to an ultra-flat finish to make surface imperfections on brick and virtually disappear. The paint contains elastomers to help resist cracking and peeling, and it also provides mold and mildew resistance. Citing durability and excellent coverage, Lowe’s buyers give Duramax 4.5 stars. It’s available in a five-gallon bucket (enough to cover 650 square feet) and can be ordered online for pick up at your local home improvement center. 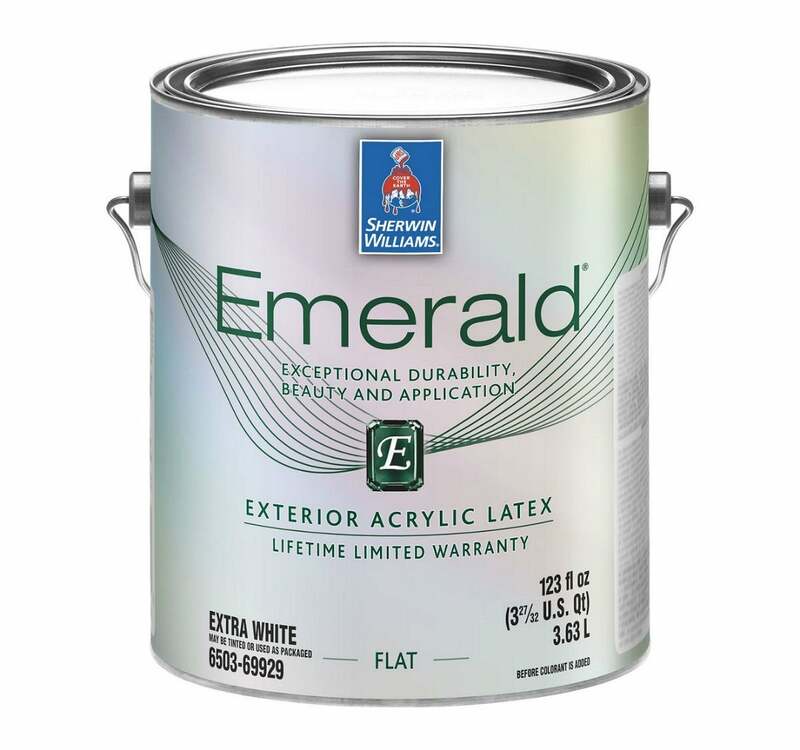 Sherwin-Williams shoppers award Emerald Exterior Acrylic Latex Paint 4.4 stars for quality and durability, and 87 percent would recommend it to friends. This premium-line paint won’t blister or peel and provides a high-hiding flat finish to conceal imperfections in siding. It contains mildew-resistant additives, making it a good choice for homes in humid climates, and is low-VOC, so fumes aren’t an issue. One gallon covers up to 250 square feet, and the paint comes with a limited lifetime guarantee. Porch and patio floors see a lot of traffic and need a tough paint to stand up to it. 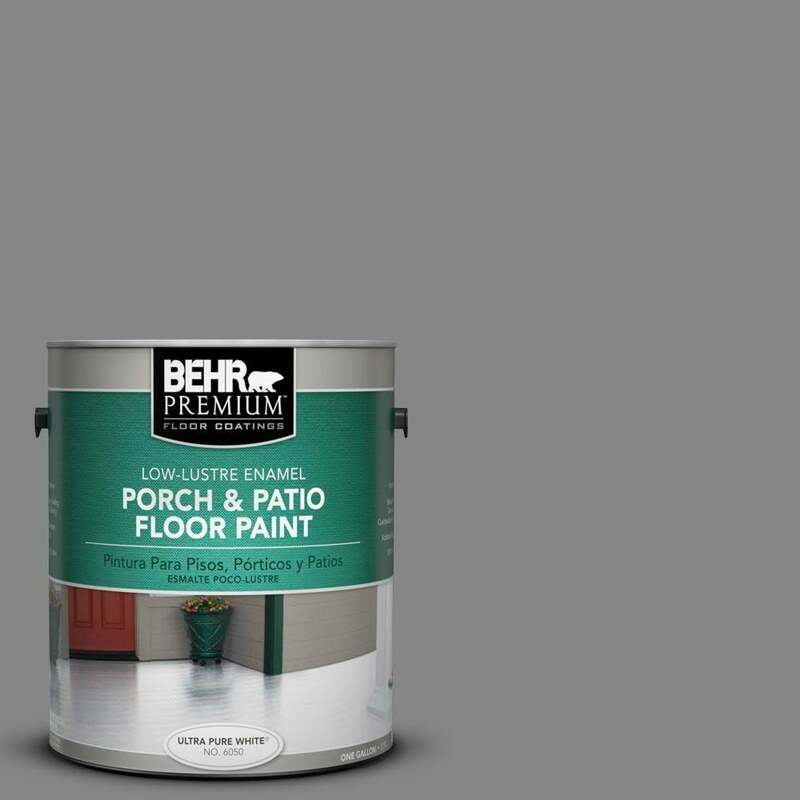 BEHR Premium Low-Luster Interior/Exterior Porch Paint fills the bill without scuffing, cracking, peeling, or wearing down underfoot. The premium porch paint resists mildew while providing a low-luster finish, ideal for most porch applications. Home Depot buyers award it 4.4 stars for durability and coverage (one gallon can do up to 400 square feet). It comes in traditional slate gray as well as other colors; you can also have it tinted to suit. 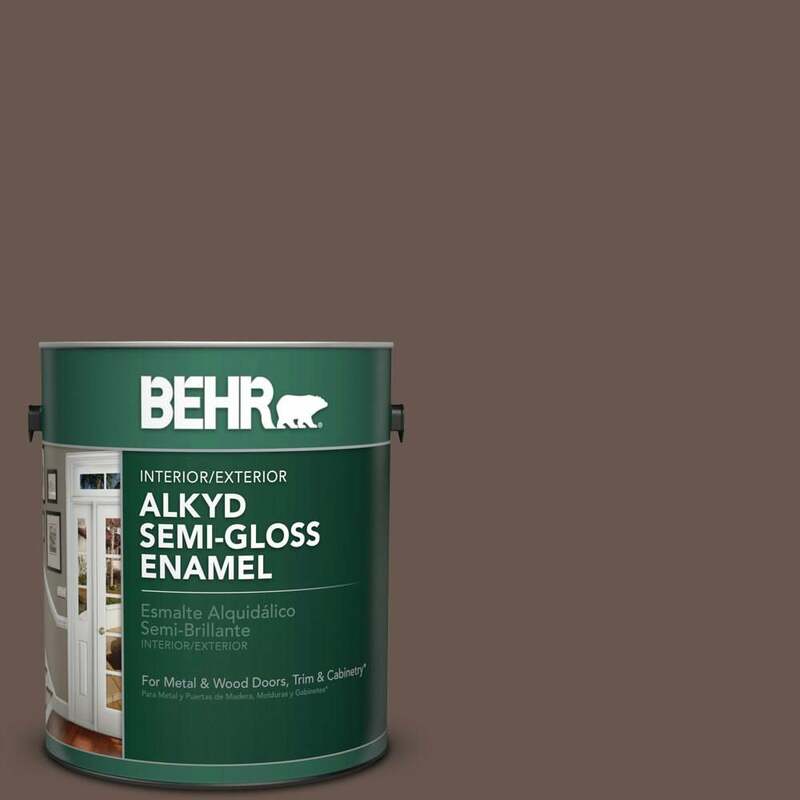 If your home currently sports oil painted doors, shutters, sills, etc., BEHR’s Semi-Gloss Alkyd Enamel is a solid choice for a refresh. Home Depot buyers give it a hearty 4.8 stars for durability, color retention, and for its professional-looking, semi-gloss finish. The paint is compatible with wood and metal, and is stain-, scratch-, and mildew-resistant. One gallon covers up to 500 square feet, and while we favor Oiled Teak, the paint comes in a host of other colors.